We had a wonderful time sightseeing Portland, Maine and south along the coast. We started by visiting Lenny, a life-sized chocolate Moose at Lenny Libby Chocolatier. There was also a bear and two cubs made of chocolate in the diorama. This candy shop has a wide variety of chocolate, salt water taffy, fudge, ice cream and gift items. Of course I bought some chocolate to take with me. From there we went to the Holy Donut shop for a unique experience. We bought a maple bacon and a potato donut with chocolate icing topped with coconut flakes. A tasty treat! We then caught the city bus and enjoyed seeing the historic homes and buildings we passed on the way to the wharf. There we caught the Casco Bay Ferry Mail boat and rode along on a three hour mail run to several of the islands in Casco Bay. During the summer there are two of these runs a day and many people buy tickets to ride along. We heard a description of the historic lighthouses and other features along the route. It was interesting to see the crew load and unload the cargo and watch the people meet the boat to pick up their items as they were unloaded. Much more than mail was included in the cargo. For instance there were several mattresses and box springs that were loaded into the back of a pickup on delivery as well as a golf cart. A couple of times the sea fog rolled in adding to the adventure. We also spent a fun afternoon seeing the beautiful coastline and visiting a few lighthouses just south of Portland, Maine. 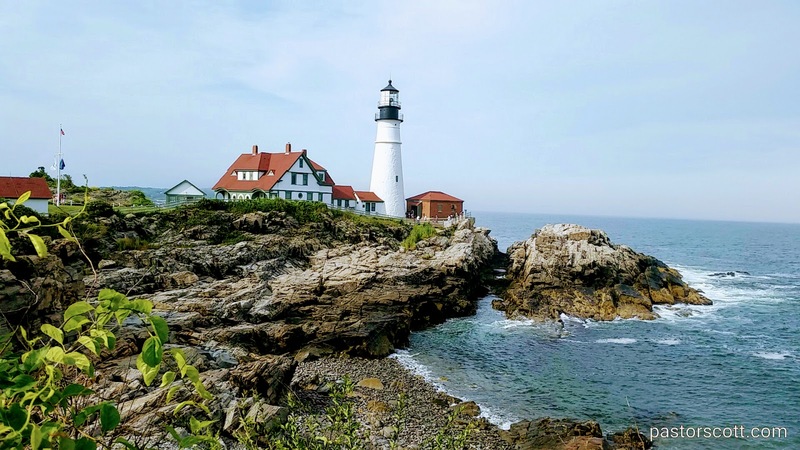 They are all historic but one that stands out is Portland Head Lighthouse. It’s construction was begun in 1787 at the direction of George Washington. We thoroughly enjoyed seeing the parks and beautiful homes in the area. This entry was posted in Jackie and tagged history, Maine, nature, review, sightseeing. Bookmark the permalink.